I am rejoicing because my blog is officially back from its 6 month hiatus! I promise to post more frequently, and this time I will uphold that promise! Much has happened since my last post–from overextension to dormancy and isolation to a metaphorical and literal springtime during which I am finally able to create out of sheer desire and joy. 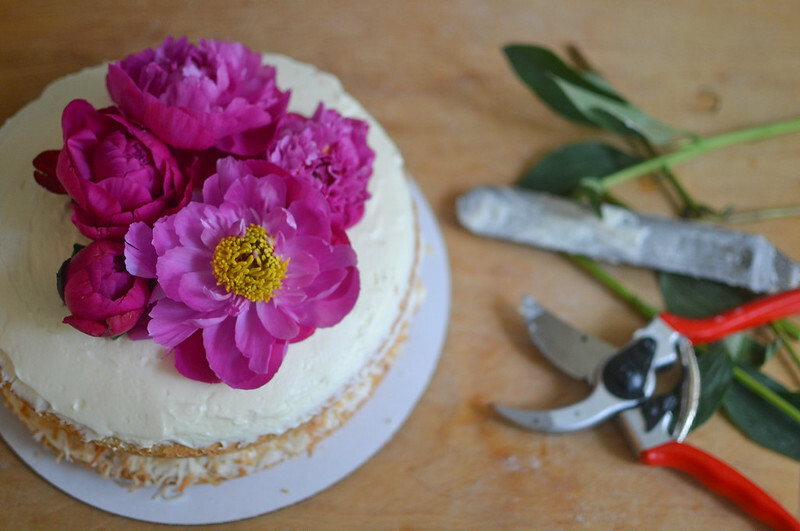 I am warning you now that this is going to be one of my longer blog posts because the process of making this cake was a rather tumultuous one that really tested my patience. 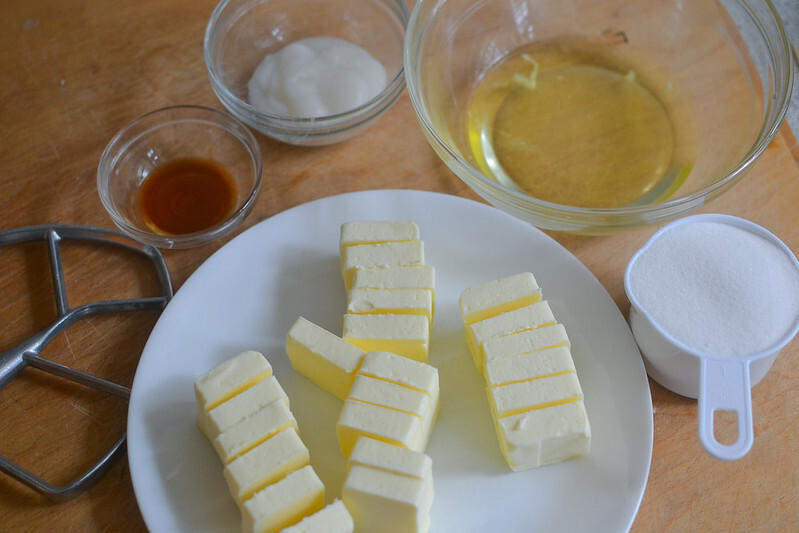 There were actual tears and four sticks of wasted butter involved so if you dare, please read along! Otherwise, just look at the pictures (they’re kind of pretty right?) but do know that these pictures were almost lost forever and this blog post almost did not exist! There were several factors involved in the desire to create this cake. My sister announced a few weeks ago that she would be getting married on June 28 (in London!) and that she was interested in the possibility of having me create either a cake, cupcakes or some type of dessert for her wedding. 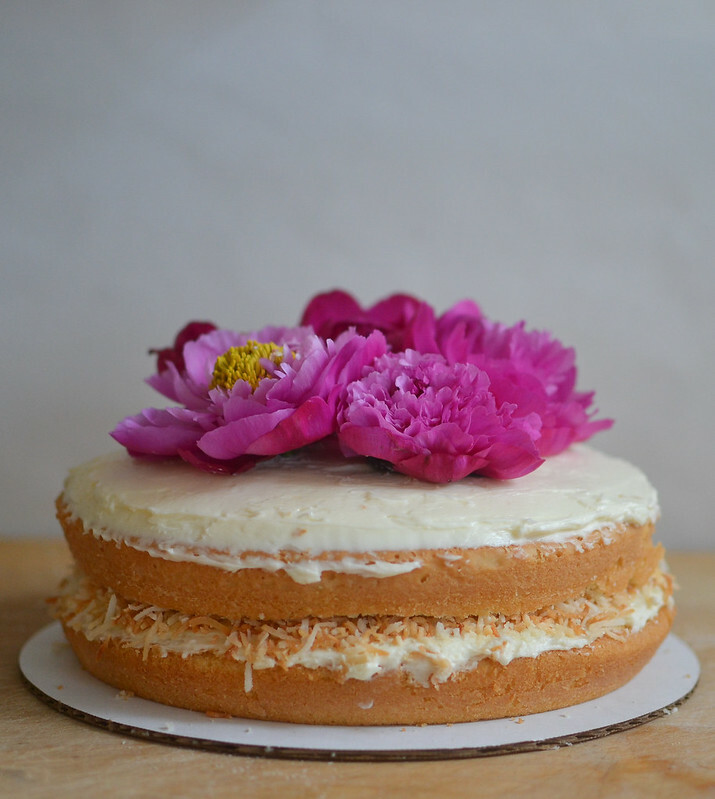 She was particularly fond of this cake that I made recently for a friend. I searched through Pinterest for “wedding cakes” and “fresh flower cake” and found a beautiful assortment of cakes decorated with fresh flowers. It just so happened that two of my great friends, Sammy and Sarah whose artistry I respect and admire, are knowledgeable about flowers and are very familiar with flower arranging. Add to that the facts that we are fast approaching peony (my favorite flowers) season and Sammy’s birthday was coming up and thus a collaboration between Sarah and I was birthed. 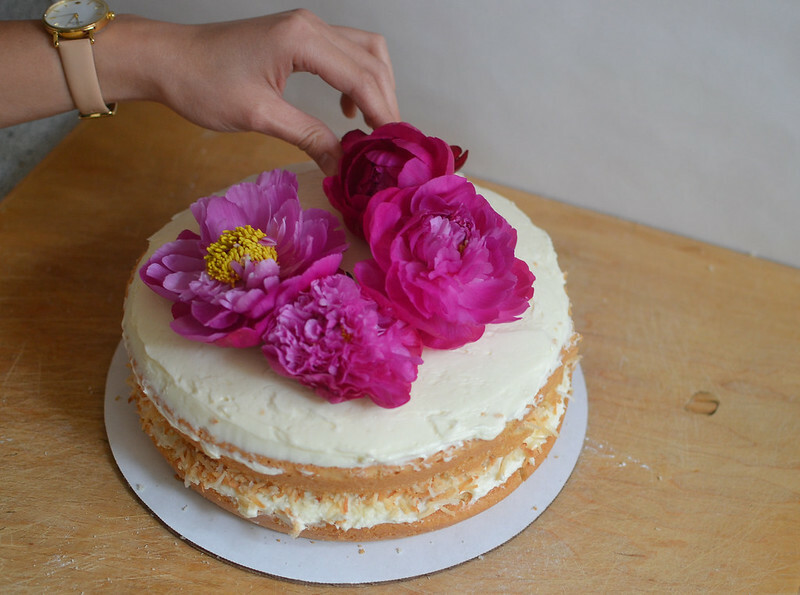 While I love piped buttercream flowers and the fact that they are edible, they don’t emanate the same beauty that living flowers do. 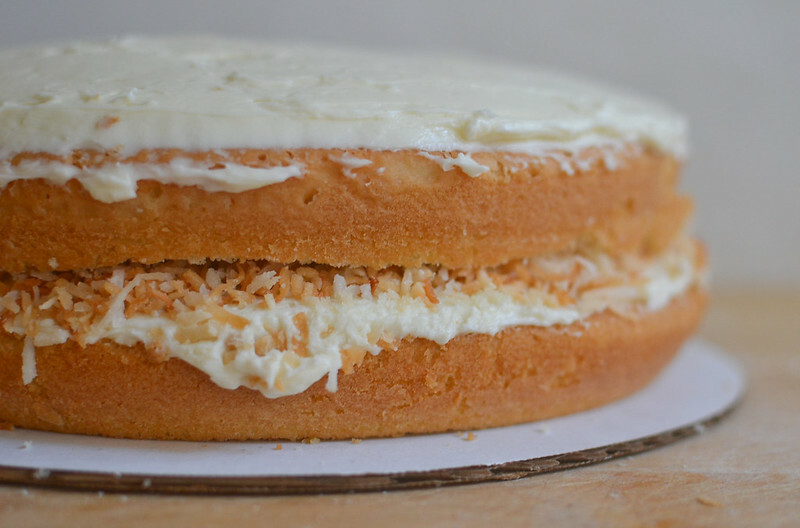 I decided to make the Coconut Layer Cake from the Baking Illustrated cookbook for the first time, trusting that this foolproof cookbook and my above average baking skills wouldn’t let me down. 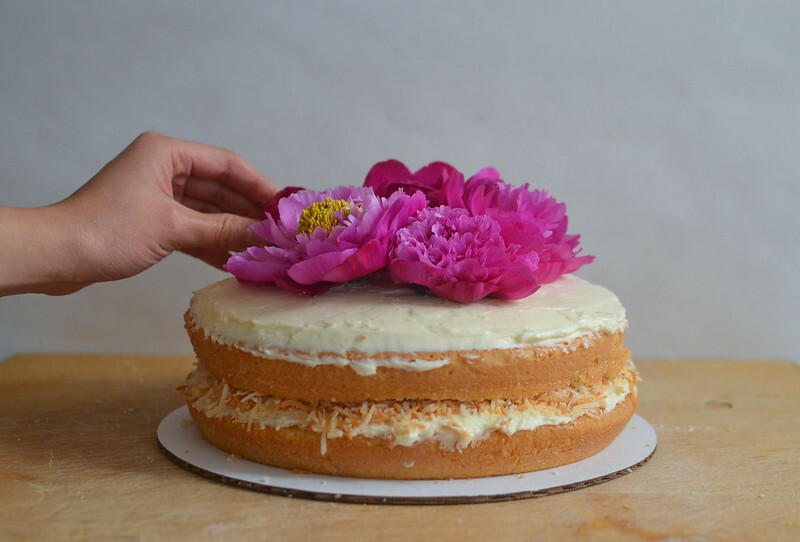 This recipe yields a light and fluffy cake because it utilizes cake flour and egg whites. It also has a very strong coconut flavor from coconut extract and an ingredient I recently (and thankfully) discovered, cream of coconut (which can be found in the liquor aisle because it is apparently used in alcoholic drinks). The cake came out of the oven nicely! 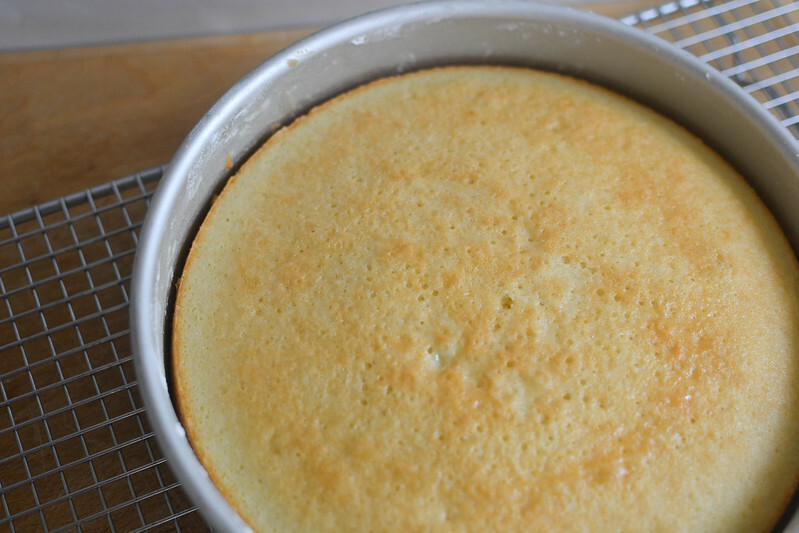 Though it did not come out of the pan as nicely… I need to remember to butter and flour the heck out of my cake pans and actually wait until it cools slightly until I pry if out of the pan. 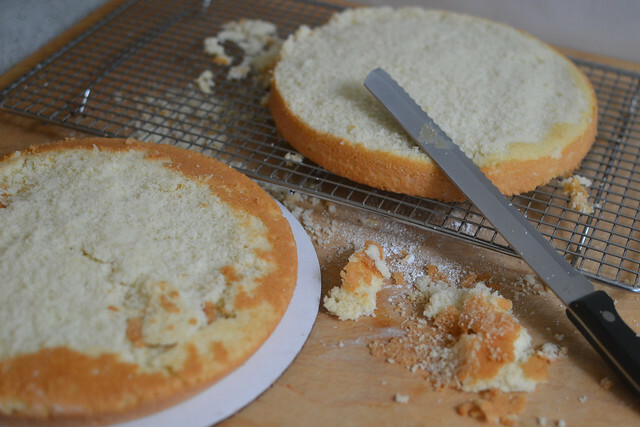 But since I didn’t spread the batter evenly throughout the cake pan, I ended up with lopsided cakes that necessitated some shaving off to level them anyways, so I got to shave off the ugly part! And then it was time to make the frosting, which was a coconut flavored Swiss meringue buttercream. 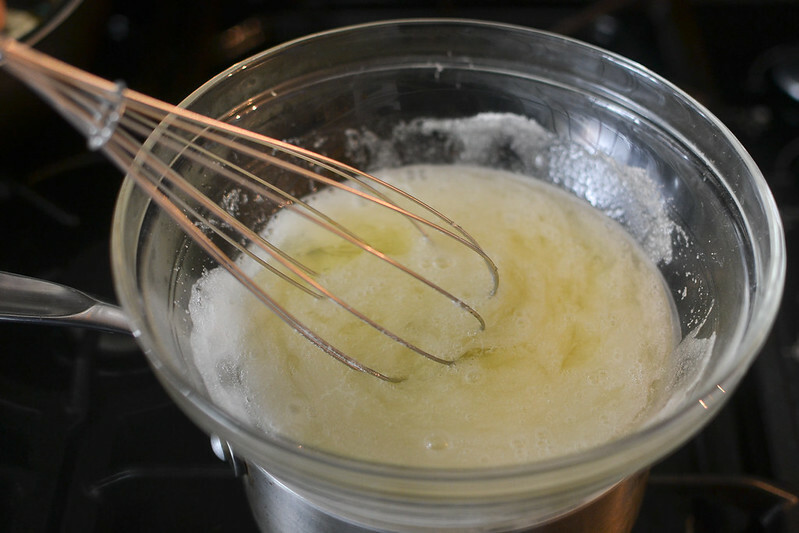 It involved the use of a bain marie/double boiler to heat up egg whites and sugar together. I was so determined to take shots of my hand whisking this mixture up that I splattered egg whites everywhere and ended up not whisking it enough. Oops. 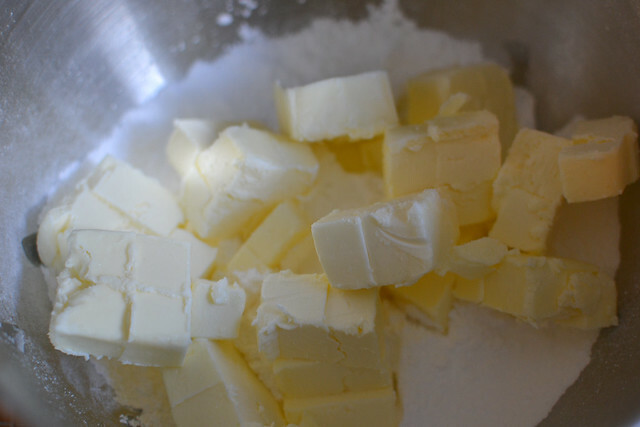 Then I finished beating the egg whites and sugar mixture in my stand mixer, letting it cool before adding the four sticks of butter in slowly and then letting that go for a little bit. I was so excited to be almost finished! But then I came back to my mixer to find a chunky, separated mixture that resembled cottage cheese. It was NOT spreadable. The butter curdled. I think I did not let the meringue cool enough and so it melted the butter when I added it. According to this blog post I found, it could’ve been salvaged. But in my frustration and impatience, I decided to walk to the market down the street and start over instead. I literally had to run back home with my four sticks of butter because in the 3 minutes that I was inside the market, a chubby cloud decided to pour rain madly over the small patch of area that encompassed my house and the market. Soaking wet I was, but at least my butter was dry! 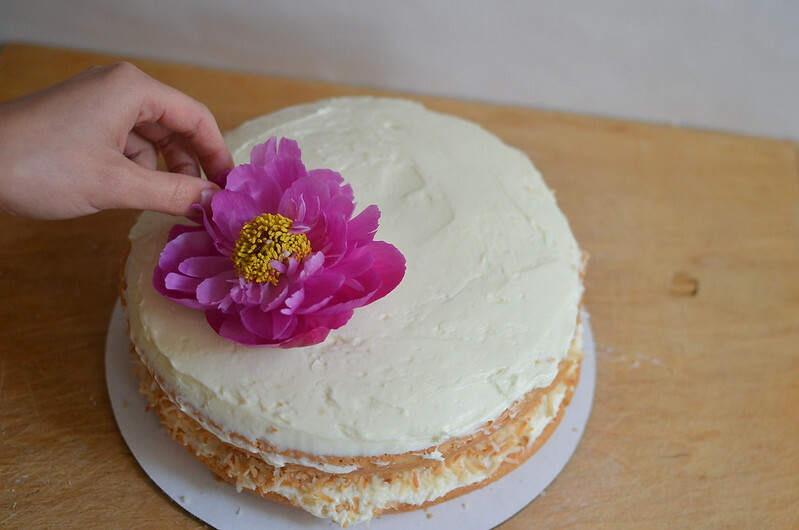 Jaded by the failed attempt at a Swiss meringue buttercream, I decided to make a simple buttercream frosting instead and improvised my way to a recipe. It still had four sticks of room temperature butter. 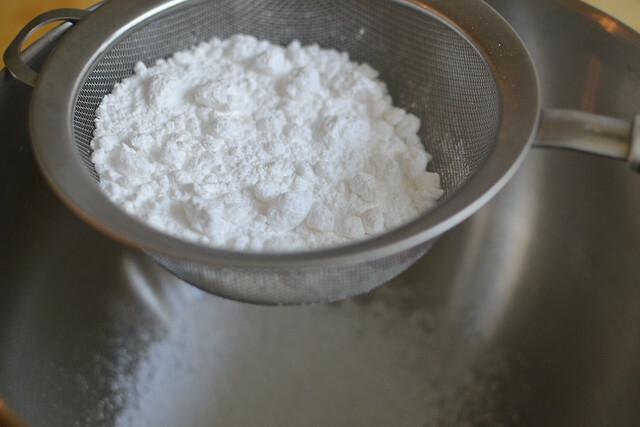 And an unknown amount of sifted powdered sugar, coconut extract, vanilla extract, and cream of coconut. I creamed it in the mixer for a while until it was soft and spreadable. 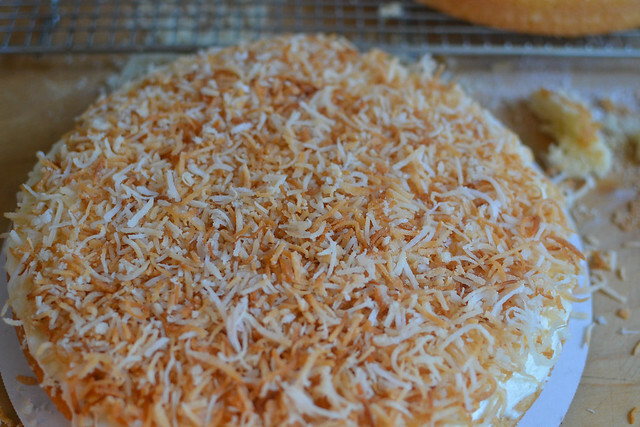 I spread the frosting on the cosmetically challenged layer, then added some toasted shredded coconut on top. The coconut was toasted in the oven for 10 minutes at 325 degrees F, then tossed and left in for another 5 minutes to achieve this ombre color gradient. Then I added the second layer on top and proceeded to ice the rest of the cake. 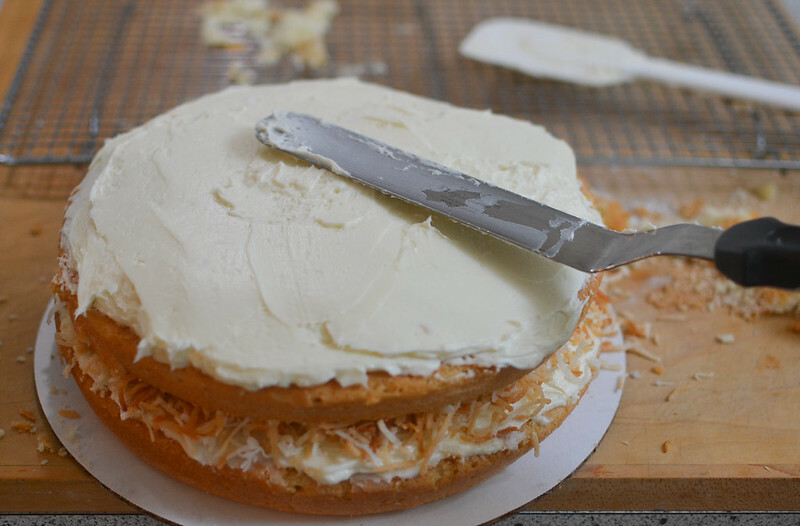 It was around this time when I realized that because I was using a new frosting recipe, it would not yield enough to cover the entire cake, sides and all, which is what I had intended to do. But I improvised instead! I mean, the bare cake, rustic look is in right? And then it was finally time to place these delicate beauties onto our canvas! 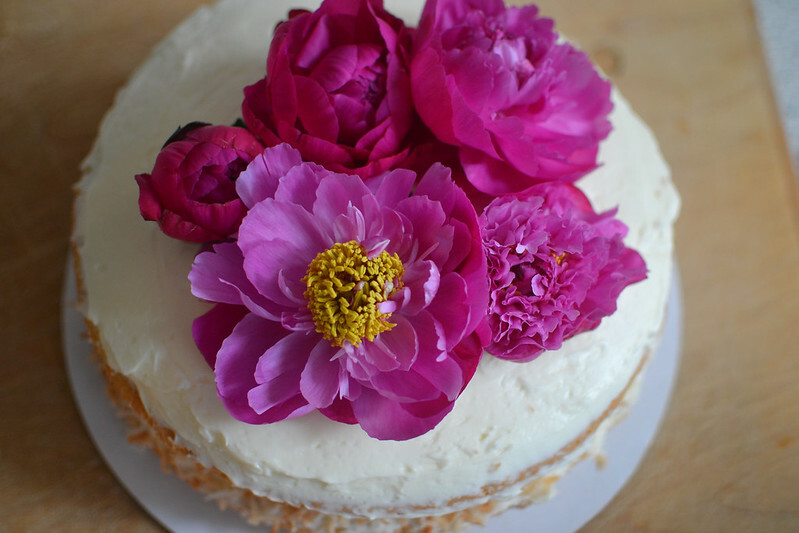 Thank you again, Sarah for so carefully cultivating these lovely peonies and so expertly placing them on this cake. The cake was finished and tasted delicious, the flowers looked beautiful and we were able to shoot some photos of this creation just as the sun was starting to disappear. A few hours later, I decided to upload some of the day’s shots onto my computer in order to start my blogging process. While uploading some pictures onto my computer, I deleted about 1,000 pictures from March 2013 to December 2013 to clear some space on my memory card. It took a while, so I decided to leave my computer and cook dinner in the meantime. When I returned to my computer, I opened Lightroom so that I could edit some photos. I tried to upload the photos from my camera, but somehow could not find them anywhere. The photos I intended to delete were gone, along with all the photos I had taken that day. I was going over what had happened in my head because it didn’t quite register that my entire creation’s documentation could’ve been lost in some digital abyss. I turned to Google for possible troubleshooting options and downloaded a software to search my camera and computer for deleted files. Nothing was found. Throughout the span of 15 minutes that this all happened in, I was surprisingly cool, calm and collected thinking “maybe it’s just not meant to be shared.” And then suddenly I wasn’t. I ran out of ideas and shut myself in my room to let out hysterical tears that wouldn’t come out. Three minutes later I decided to keep searching for ways and trying. Someone on some forum mentioned extracting deleted photos from a memory card using a particular program. This was my last option. As I held my memory card in my hands, a huge rush of peace came over me–a peace that I knew was secure whether or not the photos were recovered. I simply prayed that God’s will be done with my lost photos. I hurriedly borrowed my roommates laptop (because mine didn’t have a memory card slot), downloaded the app…AND RESTORED ALL MY PHOTOS. Every single one was recovered! I screamed for a bit and rejoiced over the fact that throughout the entire day, so many things both little and large went wrong but that in the end, everything came together. And now here I am, able to share all of it with you! 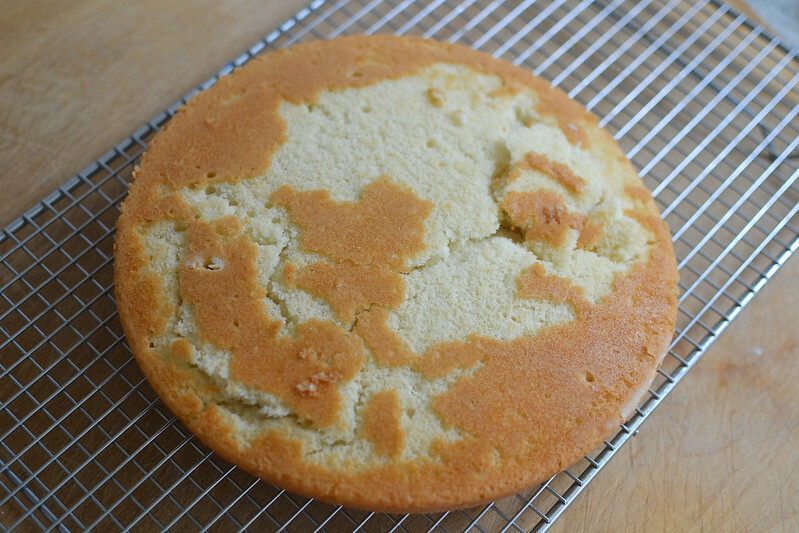 The adventure of creating this cake now seems less significant than it did at the time. But through every mishap, I learned some valuable baking AND life lessons along the way. Sometimes plans don’t always go the way you think they should and things seem like a curdled mess and you don’t always understand how it happened, but these should not be invitations to give up! Improvise and persevere. Throughout this past season, I’ve learned to hold tightly to my peace and joy to refuse to be shaken when both tiny or large obstacles come at me. It has a made a world of difference. Here is one last shot of this beauty! Cheers to the next baking adventure!